I've said it before and I'll say it again. Being allergic to peanuts has me obsessed with almond butter. I first made these cookies this summer. The day after I made them my sister ironically sent me the recipe the next day thinking I would love them! I blogged about Ambitious Kitchen earlier this week. It is my favorite food blog right now. When my friend first introduced me to the site this summer we quickly made these cookies after perusing Monica's blog! We whipped these up in under 15 minutes! The dough is pretty greasy when you first mix it but they bake up great! I also love the little sprinkle of sea salt on top to get that salty/sweet combo! The second time I made these I used honey instead of maple syrup, I recommend maple syrup. The flavor just worked better than the honey. 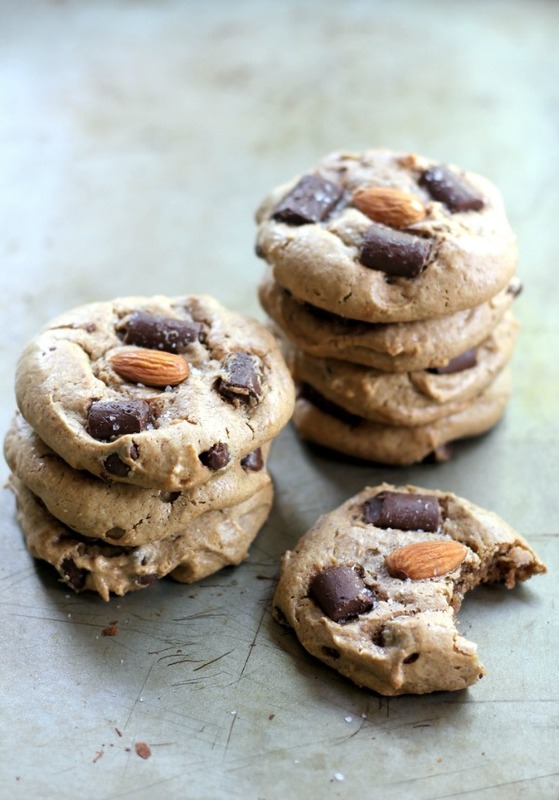 I also love the use of almond extract paired with the almond butter! In a medium mixing bowl, beat together almond butter, honey (or maple syrup), egg, vanilla, baking soda, and salt until smooth and creamy; about 2 minutes. Fold in 1/3 cup of chocolate chunks. Drop tablespoon sized balls of dough onto a baking sheet lined with parchment paper, top each cookies with extra chocolate chunks and an almond if desired. Bake for 10-12 minutes or until cookies turn a slight golden brown underneath; they will be puffy! Cool on the baking sheet for 10 minutes then transfer to a wire rack to cool completely. Repeat with remaining dough. Makes 15-18 cookies. Pairs perfectly with a glass of almond milk! Let The Fall Baking Begin!